Switching FETs wired up wrong. The board required modification to fix this one and allow the GPS module to turn on. 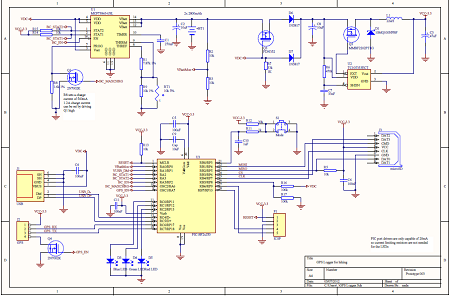 USB Charging Port detection circuit probably wouldn’t work, due to the FET issue above. Isolation of the processor & GPS from the battery when charging. Excessive current draw while charging will confuse the charge controller and could result in battery over charging, fire and explosions. Hardware SPI for the SD Card. Seeing as the circuit needs to be redesigned, basing it around a processor with separate SPI and RS232 ports will allow data to be written to the card much faster, resulting in less dropped data and a lower power draw as the processor will spend more time sleeping. Taking the above items into consideration I redesigned the circuit, shown below, based around a PIC18F2xJ50 microcontroller. USB Charge Port detection has been removed at this stage. To include it would require simulating the proposed circuit against the specification to ensure correct operation, which I should have done the first time around. Additionally the value for R8 should be revised to ensure that the logger doesn’t consume more than 500mA when operating from a USB (non-charging) Port and charging the battery. At this stage there is no intention to finish the GPS Logger, all information will remain here for reference purposes. I may desire to finish it at some stage but currently all the hardware is in another country. This entry was posted on July 6, 2012, 1:56 pm and is filed under Make. You can follow any responses to this entry through RSS 2.0. You can leave a response, or trackback from your own site.